From Friends To Soulmates, Tahira And Ayushmann's Love Story Will Make You Believe In True Love! Talk of fairy-tale romances and the only couple we can think of is Ayushmann Khurana and Tahira Kashyap. The couple has been giving us goals for years now. Their love story has been nothing short of a romantic movie. Today, as they stand together as strong pillars for each other, be there for each other in every thick and thin, they tell us, how a perfect couple looks like. Tahira and Ayushmann have been together for over a decade now and we wonder how they do it all perfectly as a couple. Let’s head back to the time when the two met and fell in love. 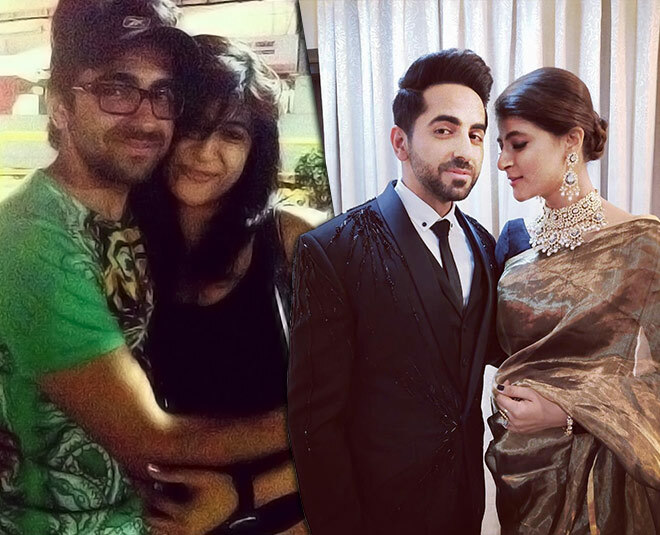 Tahira was at Ayushmann’s home that night and never knew that would bring them so close. Tahira was quite impressed with Ayushmann that day. "I had this impression of him being a ‘cute guy’. But that night, he bowled me over with his charm, wit and of course, with the songs he sang." After school, they became good friends and started dating. They both pursued a master's degree in Mass Communication but from different colleges. They even participated in debate and dramatics competitions from their respective colleges and fought against each other. Marriage was on the mind of Tahira and Ayushmann after college but they had no clue about their careers. Ayushmann wanted to become an actor and that is when she gave all the hopes of marriage. She knew that her parents won’t accept this idea of marrying someone who is struggling to become an actor in Mumbai. Their marriage eventually happened in the year 2011, also when Ayushmann formally proposed Tahira in the most dreamy way possible. Tahira shared, "Ayushmann formally proposed to me just last year when we got married in November 2011. He did it like a gentleman with a ring, music playing in the background, red roses, wine and a romantic candlelight dinner." Well, it is difficult for a woman to support a man while he is struggling to become someone and motivate him constantly. Tahira was one such woman! The first few years of Ayushmann and Tahira’s marriage were not very smooth. Life tested them in these years. While Ayushmann was struggling to become an actor in Mumbai, Tahira was in Chandigarh. Things started to change when Ayushmann’s debut Vicky Donor became a huge hit and Ayushmann became a star overnight. In the year 2015, Tahira shifted to Mumbai. The couple also worked professionally for Tahira’s directorial debut Toffee, which was a short film on child marriage and was produced by Ayushmann. On the World Cancer Day, when Tahira posted a picture of her bare back that had a scar from her mastectomy, Ayushmann was there to applaud her along with all others. Ayushmann is totally in love with his lady’s brave move and can’t really stop praising her. He always shares that it is Tahira who inspires her each day and has made him a better person in life today. Tahira and Ayushmann have two kids and they are adorable! The couple is currently living a life that they always dreamt for. We are so thankful to them that they are so active on social media. They keep expressing love for each other over social media and love to see it all. Seeing Tahira and Ayushmann’s journey from being friends to now finally soul mates, we have started believing in true love! The two lead an equal partnership at home. There is lots of love and support that makes their relationship stronger each day. On the work front, Tahira is all set to direct another movie and this one is produced by T Series’ Bhushan Kumar and Ellipsis Entertainment’s Tanuj Garg and Atul Kasbekar. Ayushmann will be seen next in Dream Girl opposite Nushrat Bharucha.